Welcome to DESPERATE.COM! The finest and most comprehensive line of nostalgic reproductions on the web. Desperate Enterprises reproduces some of the more popular images and makes them available at modest prices for wholesalers. Check out these great novelty items and licensed collectibles. Our company is among largest distributors of kitchen, bathroom, remodeling and flooring products in the United States. One of the fastest growing online Business-to-Business wholesale & export company offering clients a ONE-STOP-SHOP for over 4000 LEADING health & beauty, general merchandise, grocery, confectionery & automotive BRANDS. We ship ANY BRAND, ANYWHERE!. We are a manufacturer and distributor of 100% natural cat and small animal litter, absorbent for automotive, industrial, janitorial, household use, wood fuel pellets, horse, livestock, and poultry litter and bedding. We ship internationally from our multiple locations. Our products are all pine. We specialize in closeout general merchandise at the lowest prices. Why so low? Because we take possession of the goods and maintain our own warehouses. We offer a variety of merchandise, including our 2500mAh Ultra Slim Power Bank. This ultra slim mini sized Power Bank has high-speed charging technology perfectly designed for smartphones. It includes an emergency back-up external battery for phones and other electronic devices. Reedyville Goods is a manufacture of aluminum hot rod, garage art, motor oil, and gas station signs. We can also make customized products with your business logo on them. Wholesale supplier of licensed, Made in USA NCAA license plates and metal signs. We also carry 12" x 17" metal signs made in China. We have been in business since 1995. After 44 years in the closeout, surplus, salvage, discontinued items, package change, label change business - we have developed a unique technique in which we are able to supply you with money-making items. We cater to your exact needs by always trying to help our customers achieve their goals and to make excellent purchases on products. Triumph Plant Company provides retailers with complete gardening kits, unique gifts, and hard to find items! Being in the garden industry for over 40 years, we reach every age and level of gardener with our product line. We also won the retailer's choice award! Importer of housewares and kitchenware. Great items, great prices, great deals and steals! Seasonal items also available. We import home and kitchen items that suit your consumer's needs. JOEE is the ultimate accessory for coolers! With 3 unique compartments, an interior lid that function as a handy cutting board, JOEE is ready for any adventure. Compatible with YETI, Cabelas, Coleman, Igloo and many other cooler brands, JOEE is ready to make sure your sandwiches arrive at your campsite dry. Contact us for wholesale pricing. Ideal Wrap is a branded, organic and eco-friendly beeswax wrap made from high quality materials, including GOTS certified organic fabric. We offer very low minimums, fast and free shipping, as well as great margins! We have multiple prints and variety packs to choose from. We also have access to other colors, patterns, and sizes for large orders! We are one of America's finest manufacturers of wholesale home and garden decor. Our huge selection includes over 750 items for you to shop from. Our Metal Art pieces are created by American artisans. CopperPaw Mat and Copperfoot Mat are the first and only mats that kill 99.9% of bacteria on contact from the paws of pets and shoes. It works 24/7, never wears away, 100% recyclable, and the CuVerro Shield copper is EPA registered. Not harmful to pets or humans. Discount Truckloads is a wholesale liquidator of general merchandise, cosmetics, tools & hardware, domestics and clothing from major retailers. Our closeouts, surplus, overstock and discount pallet sales, truckload sales and other loads are perfect for resellers. ienjoy Home is a national supplier of linens, offering case packs of solid colors and assorted colors. 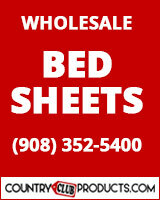 We have the lowest industry wholesale pricing in all 50 states! Tipsy Coasters offers absorbent drink and car coasters, magnets, greeting cards, and home decor printed with graphics and sayings everyone can appreciate. Customers literally laugh out loud shopping! Our products sell out even in the slowest seasons. Everything is proudly made in America. Wholesale home decor accessories and unique gifts. Home accents, bath and body gift baskets, candles and centerpieces, Christian gifts, home furnishings, garden decor, lanterns and seasonal merchandise. No minimum order. FBA Service. Free Dropshipping. Secure online shopping. Fast order processing. TampaBay Wholesale is a wholesale reseller of closeout merchandise from national retailers and major department stores. We specialize in name brand closeout apparel, jewelry, cosmetics and general merchandise from major retailers. We ship worldwide! Suncatcher window decorations - over 500 designs. High volume sales with excellent profit margin. Easily turn our suncatchers into nightlights for added profit. Over 100 styles of suncatcher key chains and magnets. Great items for gift shops, convenience stores, mall kiosks, craft shows/festivals. Aromatic Research and Technology Systems, LTD.: Leaders in research, design and manufacturing of highly innovative Air Fresheners for auto, home and work environments. We offer unique, patented air freshener designs that are create higher margin value for our customers. Home Excellence Inc. is one of the leading importers and distributors of Himalayan Crystal Salt. We specialize in Himalayan Salt products including Salt Lamps, Salt Blocks, Salt Tiles, Bath Salts, Gourmet Himalayan Salts and much more. We specialize in one of a kind wood engraved crystal grids and wall hangings as well as wood cut jewelry. All our products have a metaphysical focus. Great for new age or unique gift shops.